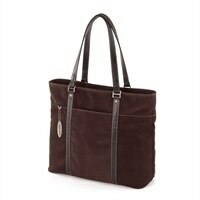 This beautiful bag combines all the features of the Ultra Tote in a soft, rich chocolate colored suede material. This elegant fabric perfectly disguises the innovation and functionality that Mobile Edge has built into these designs. No longer do you have to have to carry around a 'techy' and bland computer case!